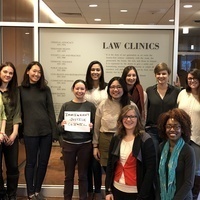 Join us to celebrate the launch of the law school’s Immigrant Justice Clinic! A distinguished group of Northeastern law graduates from the ’70s, ’80s, ’90s and 2000s will disucss the evolution of the immigration law curriculum at Northeastern and the current challenges and opportunities for immigrants’ rights advocates. Click here to register online. Registration is required.